I am all about fall. It starts getting cooler, the leaves start changing, we haven’t had time to get behind in homeschooling, and it is the beginning season of all of my favorite holidays (birthdays, Thanksgiving, Christmas). It is a gloomy fall day today and I decided it would be fun to create some new fall-inspired textures. These can be used as overlays on images or alone as digital paper. They would make lovely frames or backgrounds for photos. I am also including two editing tutorials in this post. First, I want to show you how easy it is to create these gorgeous textures using free images from Pixabay. You can download the ones I used to make this set (Leaves 1, Leaves 2, Texture 1, Texture 2, Texture 3) if you want to play along or make your own custom set. It is also very easy to go photograph your own leaves on the ground to use to make these types of textures. The leaves are still green here, so I am using stock photos. 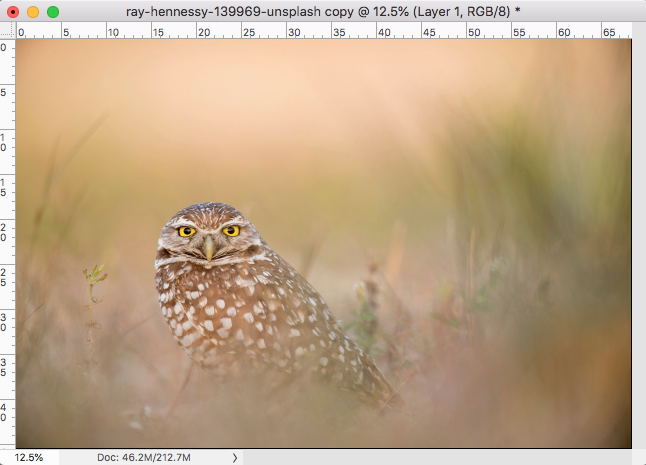 Second, I also wrote a mini-tutorial that shows you how I created this stunning owl edit. This is the original owl I used in this tutorial. You can grab the final edit ready for framing or using in your own designs here. Create a new file. You can see what settings I used (highlighted in yellow) to get a decent-sized paper. Open your first texture and drag and drop it on top of the blank file. Place the leaf photo on top. Try Soft Light, Overlay, Multiply, or Screen blending mode to see what you like best. In this example I put the leaves layer in Soft Light, 100%. I wanted to mute the color a bit, so I added a Hue/Saturation layer and moved the Saturation slider down to -31. You can also select individual colors and adjust their saturation if needed. Go ahead and add another texture on top of the previous one. I love this cracked concrete image. You can use both textures together or just this one alone. In this edit I didn’t combine the two. This time I put the leaves layer in Overlay at 78%. It looks gorgeous! I could go ahead and use the Hue/Saturation layer once again to reduce the color. However, instead of reducing the color I decided to add my own custom color using the Hue/Saturation layer. I checked “Colorize” and then adjusted the Hue, Saturation, and Lightness sliders until I loved the effect. I think this blue is gorgeous. 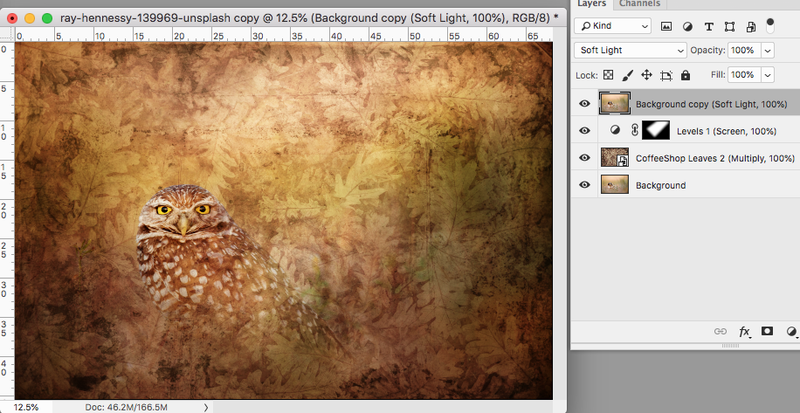 I love this owl images and knew this texture would look stunning on it! You can download the final edited image here. 1. I added the Leaves 2 Texture in Multiply, 100%. 2. I added a Levels adjustment layer and made no change to the sliders but put it in Screen blending mode, 100%. This lightens up the image. Then I used a black brush on the layer mask to remove the light so that it looks like a ray of light is coming down on the owl. You can look at the layer mask above to see where I painted. 3. Finally, I made a copy of the original image and dragged it on top and put it in Soft Light, 100%. This really makes the owl stand out. I could also add a Hue/Saturation layer on top and reduce the overall color saturation or just the red saturation if needed (or wanted). I hope you have fun with these textures and tutorials! Download the CoffeeShop “Vintage Leaves” Fine Art Textures.